At this time of year many people resolve to adopt new ways of working, which they hope will make them more effective at their jobs. Even at other times, sites such as 43 Folders and Lifehacker, tools like David Seoh’s Printable CEO and books like David Allen’s Getting Things Done are perennially popular. Even I have a copy. In fact, I have spent many hours searching for more effective ways of working. As far as I can tell, this is the ultimate displacement activity. But I have never had any success with any of the methods advocated in these sources. Part of this is undoubtedly due to my innate laziness. However, I have come to the view that although I am interested in new working techniques and ways of organising my time and activities, I am a basically disorganised person and I am unlikely to change that. As such, I have settled on some techniques that may only work for me. The more complex a way of working is, the more likely it is to be ignored. The test of a good system is how well it fits with existing practices. Over the years I have discovered that I just don’t do categorisation. My CDs are stacked irregularly, my bookshelves are a shrine to serendipity, my e-mail is never filed in topical folders. However, I do have a fairly strong sense of time. If someone asks me to find something in one of the many piles on my desk, I do so by thinking when I last saw it. That will put it in a particular place, or close to some other things I was working on at the same time. I have tried storing e-mails in folders as I work on them, but the only result is that I can’t find them when I need them. Instead, I keep everything in a folder for each year. I find Outlook’s native search function is quite good enough to find anything I have stored away. I have a fondness for gadgets. This also extends to non-electronic things — especially stationery and pens. As a result, I have had many Moleskines. I have also acquired a few very nice fountain pens. I have tried to use the Moleskines to fit particular productivity mechanisms. However, I got bored with most of them. Finally, I settled on a simple solution — basic note-taking. I now combine my basic tendency to thing of things chronologically with my interest in pens and paper. Essentially, I now make notes all the time (as long as I remember). As well as capturing things on delicious or in e-mail, I make a note of the salient points that made me want to store them away. I make notes of conversations. I make notes in meetings. As I do this, I mark the notes in the margin — a box marks a to-do (with room for a tick when it is done); an asterisk marks something important; an arrow marks something relevant to a future date or for someone else. In order to mark the passing of time, I start each day with the date, and mark continuation pages with the date in the top left-hand corner. I also use a different pen on alternate days. One day will be the Lamy 2000 using blue ink, the next I will use black ink in the Rotring 600. 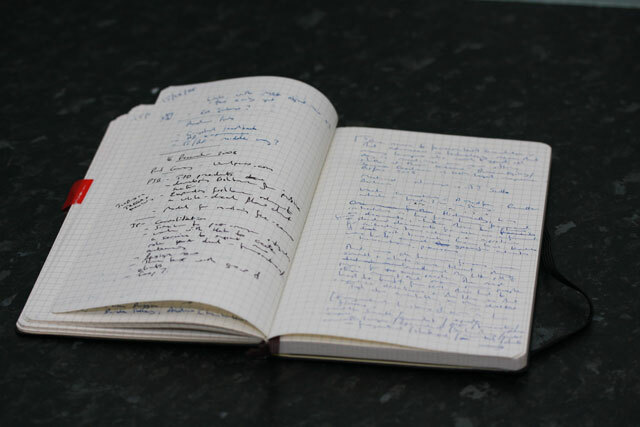 I also sometimes use the notebook for first drafts of or notes towards blog posts or other writing — I tend to do this in pencil. Since starting this process about three months ago, I have impressed myself by keeping up with it. I really think it might work for me. I even managed to carry undone to-dos over when I filled one notebook. Obviously, the note-taking is only part of the process. In order to keep up with the tasks I set myself, I set aside some time each day and a little more at the end of the week to review recent notes. Occasionally, this has brought to light other things that I had not marked as significant at the time. It has also helped me keep my focus on my key priorities. It may seem odd that I use pen and paper, with the drawbacks that old technology entails. However, I think the advantages outweigh those drawbacks. My penmanship is pretty poor, but I think it is improving as I use it more, whereas my very basic keyboarding skills seem to have reached a plateau (at not particularly speedy). Pen and paper are also more acceptable to use in a wider variety of contexts. So I aim to use the right tool for the job. Another reason for avoiding a technology solution is that it helps me avoid the distractions that are just an Alt-Tab away. Having tried it, I think my method works because it is simple, and because it fits the way I naturally think and work. Anything more complex might become an end in itself. This method is, for me, a facilitator. It might not work for anyone else, but I think those basic principles are still a good test for systems of various kinds — whether personal or organisational.